The 54th annual Grammy Awards captured the attention of bloggers and Twitter users from February 13-17, making it the No. 1 subject on both social media platforms, according to the New Media Index from the Pew Research Center’s Project for Excellence in Journalism. Not only did that represent one of the unusual occasions when the same topic led both social media platforms, bloggers and tweeters also focused on the same element of the story-the honoring of singer Chris Brown. Although pop icon Whitney Houston died the night before the Grammy event, the conversation largely centered on Brown, the winner for best R&B album of the year who drew notoriety after a domestic violence incident three years earlier. Houston’s death, however, did generate three of the five most popular YouTube news videos last week. Last week offered another example of just how potent a topic popular culture is in social media-particularly on Twitter. But this was not simply a case of bloggers and tweeters engaged in hero worship or embracing a popular entertainer. Instead it triggered commentary on the issue of domestic abuse. And there was something of a divide in the reactions to Brown’s triumphant return to the limelight at the February 12 Grammys. Some admirers who enjoyed his performance shrugged off his history of domestic abuse. But most of the reactions condemned Brown, the Grammy Awards for honoring him, and the fans that seemed to downplay his domestic violence history. Brown himself added fuel to the fire by responding to his critics on Twitter. Some of the stories that were popular among bloggers tackled the standard Grammy subjects. The AOL Music blog posted a photo spread of music stars on the red carpet. Bellasugar.com also focused on Grammy style (“Lady Gaga wouldn’t let her fans down on a night like the Grammys, and her hair and makeup were just as avant-garde as you’d expect”). MTV.com posted a summary of the winners of major music categories, such as record and song of the year. But one story that lit up the blogosphere was a list compiled by BuzzFeed.com of “25 extremely upsetting reactions to Chris Brown at the Grammys.” It consisted of culled Twitter reactions to the music star that referenced his 2009 domestic violence arrest after an altercation with his girlfriend at the time, Robyn Rihanna (known as Rihanna), also a popular recording artist. The tweets compiled by BuzzFeed came from users who were pleased by Brown’s performances at the awards ceremony. “I’d let Chris Brown beat me up,” wrote one. “chris brown could beat me all he wants, he is flawless,” wrote another. Popular blogs linked to the list and condemned the tweets. Opinion L.A., a Los Angeles Times blog, linked to the list and criticized Brown for not taking his moment in the spotlight to speak out against domestic violence. Amateur bloggers had their say, too. Brown himself entered the fray with an answer to his critics. His tweet, from February 14, read in part: “HATE ALL U WANT BECUZ I GOT A GRAMMY.” It was later deleted, but not before being noticed, captured and spread widely. 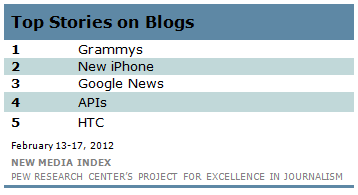 Other popular topics on blogs last week were heavily tech-oriented. The No. 2 subject focused on privacy concerns related to the latest iPhone version after it came to light that many popular applications collect names, email addresses and phone numbers from a user’s address book, often without asking permission. At No. 3 was the subject of Google, with many bloggers linking to a story evaluating the pros and cons of the Google+ platform. The Nos. 4 and 5 topics revolved around APIs (application programming interfaces) and HTC Corp., a Taiwanese phone maker that is working on a set of new mobile devices that it hopes will revive its flagging fortunes. 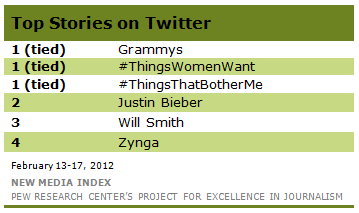 On Twitter, the most popular subjects other than the Grammys also focused on celebrity and pop culture. Tied for No. 1 along with the Grammy awards were two conversations, one about how to treat a woman nicely, and another about people’s pet peeves. Two popular celebrities-Justin Bieber at No. 2 and Will Smith at No. 3-also made the rounds on Twitter. In Bieber’s case, a video of him promoting a new singer circulated, and Smith got attention for a joke he posted on Twitter. The No. 4 subject was Zynga, a social network gaming company that launched a new game for Facebook during the week. While bloggers and tweeters focused on Chris Brown, singer Whitney Houston’s sudden death at the Beverly Hilton Hotel on February 11 at the age of 48 dominated YouTube last week. The No. 2 video, shot from a cell phone, captured Houston’s last public performance at R&B singer Kelly Price’s pre-Grammy party before her untimely death. The singer performed “Jesus Loves Me” with Price at Tru Hollywood on February 9 in Hollywood, California. The No. 3 video showed MSNBC Paige Hopkins anchoring the live coverage about the death of Houston, a news story broken by the Associated Press. Entertainment reporter Courtney Hazlett gave additional information about the singer’s career and personal life over the phone. The No. 5 video showed ABC News anchor David Muir reporting Houston’s death with a quick overview of her career that included her interview with Diane Sawyer in 2002, and a phone conversation with Chris Connelly about the singer’s career and struggle with drugs.